Eye doctors use a wide variety of tests and procedures to examine your eyes. These tests range from simple ones, like having you read an eye chart, to complex tests, such as using a high-powered lens to visualize the tiny structures inside of your eyes. Among the first tests performed in a comprehensive eye exam are visual acuity tests that measure the sharpness of your vision. These usually are performed using a projected eye chart to measure your distance visual acuity and a small, hand-held acuity chart to measure your near vision. A screening test that checks your color vision often is performed early in a comprehensive eye exam to rule out color blindness. In addition to detecting hereditary color vision deficiencies, color blind tests also can alert your eye doctor to possible eye health problems that may affect your color vision. During a cover test, your eye doctor will ask you to focus on a small object across the room and will then cover each of your eyes alternately while you stare at the target. The test is then repeated with you looking at a near object. During these tests, your eye doctor will assess whether the uncovered eye must move to pick up the fixation target, which could indicate strabismus or other problem that could cause eye strain or amblyopia ("lazy eye"). Ocular motility testing is performed to determine how well your eyes can follow a moving object and/or quickly move between and accurately fixate on two separate targets. Testing of smooth eye movements ("pursuits") is more common. Your eye doctor will have you hold your head still and ask you to follow the slow movement of a hand-held light or other target with just your eyes. If quick eye movements ("saccades") also are tested, your eye doctor might have you move your eyes back and forth between two targets positioned some distance apart from each other. Problems with eye movements can cause eye strain and may affect reading ability, sports vision and other skills. Stereopsis is the term used to describe eye teaming that enables normal depth perception and appreciation of the 3-dimensional nature of objects. In one commonly used stereopsis test, you wear a pair of "3D" glasses and look at a booklet of test patterns. Each pattern has four small circles, and your task is to point out which circle in each pattern looks closer to you than the other three circles. If you can correctly identify the "closer" circle in each pattern, you likely have excellent eye teaming skills that should enable you to experience normal depth perception. Your eye doctor may perform this test early in the eye exam to obtain an approximation of your eyeglass prescription. In retinoscopy, the room lights will be dimmed and you will be asked to focus on a large target (usually the big "E" on the eye chart). As you stare at the "E," your eye doctor will shine a light at your eye and flip lenses in a machine in front of your eyes. This test estimates which lens powers will best correct your distance vision. Based on the way the light reflects from your eye, your doctor is able to estimate the power of eyeglasses required to correct your vision. This test is especially useful for children and patients who are unable to accurately answer the doctor's questions. This is the test that your eye doctor uses to determine your exact eyeglass prescription. During a refraction, the doctor puts the instrument called a phoropter in front of your eyes and shows you a series of lens choices. He or she will then ask you which of the two lenses in each choice looks clearer. Based on your answers, your eye doctor will continue to fine-tune the lens power until reaching a final eyeglass prescription. The refraction determines your level of hyperopia (farsightedness), myopia (nearsightedness), astigmatism and presbyopia. Your eye doctor also may use an autorefractor or aberrometer to automatically estimate your eyeglass prescription. With both devices, a chin rest stabilizes your head while you look into the instrument at a pinpoint of light or a detailed image. An autorefractor, like a manual refraction, determines the lens power required to accurately focus light on your retina. Autorefractors are especially helpful for determining an eyeglass prescription for young children and other patients who may have trouble sitting still, paying attention and providing feedback that the eye doctor needs to perform an accurate manual refraction. Studies have shown that modern autorefractors are very accurate. They also save time. The autorefraction takes only a few seconds, and the results greatly reduce the time required for your eye doctor to perform a manual refraction and determine your eyeglass prescription. Aberrometers primarily are used for custom or wavefront LASIK vision correction procedures, but many eye doctors are now incorporating this advanced technology into their routine eye exams as well. Slit lamp exam of the front of the eye. A slit lamp is a binocular microscope (or "biomicroscope") that your eye doctor uses to examine the structures of your eye under high magnification. It looks somewhat like a large, upright version of a microscope used in a science lab. During the slit lamp exam, you will be asked to place your forehead and chin securely against the rests on the front of the instrument and your doctor will begin by examining the structures of the front of your eyes — including your eyelids, cornea, conjunctiva, iris, and lens. With the help of a hand-held lens, your doctor may also use the slit lamp to examine structures located farther back in the eye, such as the retina and optic nerve. A wide range of eye conditions and diseases can be detected with the slit lamp exam, including cataracts, macular degeneration, corneal ulcers and diabetic retinopathy, etc. Testing for glaucoma typically begins with measuring the pressure inside your eyes. A common glaucoma test is the "puff-of-air" test, technically known as non-contact tonometry, or NCT. For NCT, the test begins with you putting your chin on the machine's chin rest. While you look at a light inside the machine, the doctor or a trained assistant will puff a small burst of air at your open eye. It is completely painless, and the tonometer does not touch your eye. Based on your eye's resistance to the puff of air, the machine calculates your intraocular pressure (IOP). If you have high eye pressure, you may be at risk for or have glaucoma. Another type of glaucoma test is performed with an instrument called an applanation tonometer. The most common of several versions of this instrument is mounted on the slit lamp. For this test, your eye doctor will put yellow eye drops in your eye to numb it. Your eyes will feel slightly heavy when the drops start working. This is not a dilating drop — it is a numbing agent combined with a yellow dye that glows under a blue light. Then the doctor will have you stare straight ahead into the slit lamp while he or she gently touches the surface of your eye with the tonometer to measure your IOP. Like NCT, applanation tonometry is painless and takes only a few seconds. At most, you may feel the tonometer probe tickle your eyelashes. To obtain a better view of the eye's internal structures, your eye doctor instills dilating drops to enlarge your pupils. Dilating drops usually take about 20 to 30 minutes to start working. When your pupils are dilated, you will be sensitive to light (because more light is getting into your eye) and you may notice difficulty focusing on objects up close. These effects can last for up to several hours, depending on the strength of the drop used. In some cases, your eye doctor may want to check for the possible presence of blind spots (scotomas) in your peripheral or "side" vision by performing a visual field test. These types of blind spots can originate from eye diseases such as glaucoma. Analysis of blind spots also may help identify specific areas of brain damage caused by a stroke or tumor. 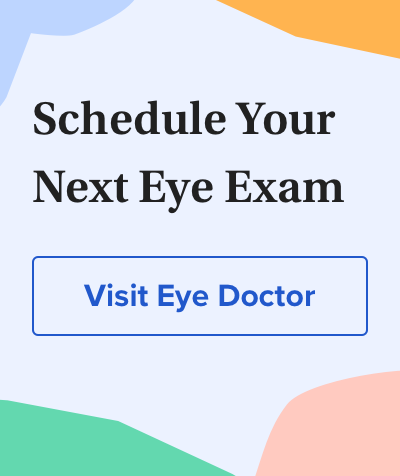 In some cases, besides these common tests performed during a comprehensive eye exam, your eye doctor may recommend other, more specialized eye tests. Often, such tests are performed by other eye doctors, such as retinal specialists, on a referral basis. It's important to understand that a comprehensive eye exam typically does not include a contact lens fitting, and therefore you will not be given a contact lens prescription at the end of a routine eye exam. Exam of retina after pupil dilation. Generally, it's better to have your eye exam and your contact lens exam performed at the same practice. Sometimes, if you have these exams performed at different locations, the ECP conducting your contact lens fitting will want to repeat certain tests already performed at your comprehensive eye exam. In part, this is done for liability reasons — to verify the accuracy of your eyeglasses prescription and make sure your eyes are healthy enough to wear contacts. This duplication of effort often will result in additional costs that you would not experience if your eye exam and contact lens exam were performed at the same location. If you need or want to go elsewhere for your contact lens exam after having a comprehensive eye exam, be sure to ask if additional fees will be required to repeat testing already performed during your eye exam.